Rollerblade Macroblade 100 Women black green - also in the new year decorate the skate 4x 100mm Supreme wheels with 85a hardness, as well as fast-SG 9 ball bearings. For the lacing as same as previouse year also you can find again the old proven technology with ratchet strap, Velcro and laces. The convenient and easy driving 100mm ladies inline skate of Rollerblade, does not really seem to be a complete novelty. Through the long 30.5 cm long frame and 100 mm wheels with 85a hardness, the skate is perfect for long distance runners and marathon enthusiasts. The new Macroblade 100 women is as same as the last year's Skate an absolute top model for women's. A very comfortable inner boot and a powerful frame with 4x 100mm wheels make the Macroblade for a real winner skate. 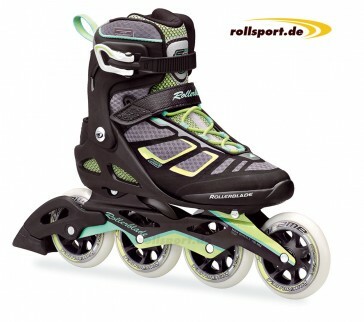 A 45° Velcro, a ratchet strap, and a normal lacing, adorn the fitness skate of Rollerblade.